With only a handful of good options from OnePlus, Samsung, Poco, and a few other brands, the recently launched Nokia 8.1 comes across as a worthy contender. While there are plenty of choices for consumers in the entry-level, mid-segment or flagship category of smarpthones, the mid-premium range has limited offerings. With only a handful of good options from OnePlus, Samsung, Poco, and a few other brands, the recently launched Nokia 8.1 comes across as a worthy contender. The phone's premium built has been topped with the clutter-free stock Android interface. The Nokia 8.1 is sheer beauty. It has a very well thought of and balanced design. Although a 6.18-inch screen dominates the front, its curved edges and dual-tone anodized metal frame steal the show. Our review unit was in steel/copper colour, which looked more like dark burgundy wine. In dark, the rear appeared black. But even with little light, the burgundy colour popped out. The inner die-cast metal chassis in the smartphone is encased in sculpted glass on both sides for this stunning finish. Moreover, the phone has a soft finish that makes it a little slippery to hold. Complementing the design are the neatly placed buttons--volume control and power key on the right panel. Circular fingerprint scanner placed at the rear is comfortable to reach and unlock the device. The left panel of the phone houses the SIM tray, while the bottom panel features the Type C charging port along with speaker grill and 3.5mm audio port at the top. It weighs 180 grams and at 7.97mm doesn't feel too thick to hold. With a wide notch at the top and broad chin at the bottom, the 6.18inch display dominates the front. Text appears sharp and colours pop-out on this full HD+ display. 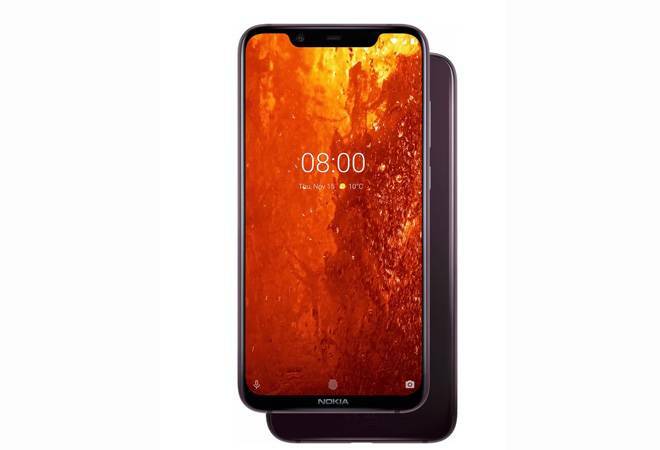 HMD claims to have enhanced the viewing experience with the PureDisplay technology that automatically adjusts colour, contrast and brightness according to the usage. However, one is not stuck with the PureDisplay as from display settings, I was able to switch to vivid, cinema and basic display setting. Adaptive brightness has been turned on by default, and it brings down the screen brightness significantly when indoors. At times, it was down to 14 per cent, and the screen started looking dull. I ended up turning off this screen setting and used it at 100 per cent brightness. Nokia 8.1 packs in a dual camera module at the rear and a single camera at the front, both capable of capturing bokeh images. The one at the rear comprises the 12-megapixel main camera with ZEISS Optics along with a 13-megapixel depth-sensing camera for bokeh images. The camera app is pretty simple with loads of options. I was able to switch between various modes-photo, pro, live bokeh, panorama, square, video, slow motion and time-lapse-just by swiping my finger across the screen. Within the photo mode, there are loads of options such as Google Lens, motion off/on, beauty, bothie, and more. The camera is quick to focus and capture images. The results shot in the bright day are sharp with natural looking colours. I was able to capture depth images using both the front and the rear camera. While I was able to adjust the background depth when capturing an image using rear camera, there wasn't such an option for images captured using the 20-megapixel front camera. Nokia 8.1 struggled in low-light photography and that's where the Pro mode comes to the rescue (available in front camera too). I was able to adjust ISO, white balance, shutter speed and more under this mode. One thing I love about the new Nokia phones is the operating system and user interface. HMD Global has kept it all clean and simple by opting for Google's Android One instead of building its custom UI. There are only a handful of necessary apps apart from Google apps and services, including calendar, calculator FM Radio, support and wallpapers. There isn't any unnecessary bloatware or third-party browsers, app stores or messaging apps. Shortcuts can be added to the homescreen. You can even create folders and place similar apps in each one of them. Swiping up from the bottom of the screen brings up the app tray. In case many apps installed on the phone, scrolling down can be a little tiring--hence, the search bar within app tray comes handy. Also, the top row is taken over by the most frequently used apps for quick access. Physical navigations buttons are long gone. The onscreen home button can also be used for launch Google Assistant. Another plus point of Android One is the timely security patch updates that the platforms receive. HMD Global isn't competing on specifications but the experience it offers. Unlike some of the competition, it doesn't run on flagship 845 processor. Instead, it has Qualcomm Snapdragon 710 processor, paired with 4GB of RAM and 64GB internal storage. In day-to-day usage, it manages to handle all apps and processes smoothly. This includes streaming videos, gaming, Asphalt, clicking images and videos, browsing the web, social networking and more. Even with multiple apps running it the background, the Nokia 8.1 didn't slow down even once during the week's testing. It scored 159650 on Antutu benchmark test. This is topped with a good battery backup. The 3500 mAh battery supports quick charge and lasted me a day and a half on a full charge. Verdict: Nokia 8.1 comes is a combination of premium hardware topped with neat Android One, priced aggressively at Rs 26,999.